This podcast is a recording of a panel discussion at the Reimagine Education Conference on November 30, 2018, in San Francisco. 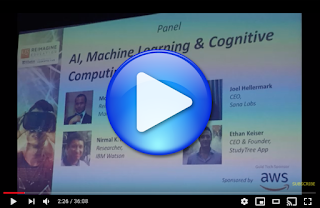 You will hear from the panelists: Joel Hellermark (CEO of Sana Labs), Nirmal Mukhi (researcher at IBM Watson) and Ethan Keiser (CEO of Studytree) about how AI and machine learning can supplement education. Each panelist gives a brief introduction to their work in AI and answers questions from the moderator, Jack Moran of QS Quacquarelli Symonds, the Reimagine Education Progam Manager. Scandalous Abyss by Rod Murray using Jukedeck - create your own at http://jukedeck.com.